Figure A13. Banda anomaly, interpreted as the Banda slab, with (horizontal) [vertical] cross sections through (A)[D] the UUP07 p-wave) and (B)[D] the combined SL2013 and S40RTS s-wave models at 370 km; C) the location of the modern geological record that we interpret to have formed during the subduction of the slab. 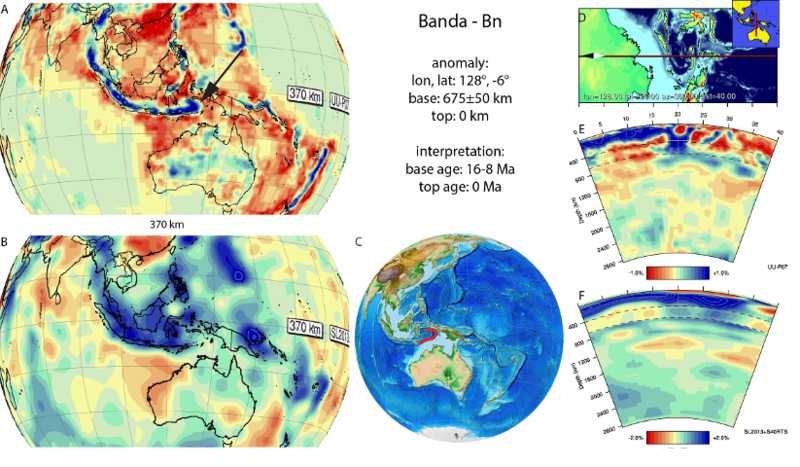 The Banda anomaly (Figure A13) is interpreted as an amphitheatre-shaped, south-, west-, and north-dipping slab that underlies the Banda Sea in southeast Indonesia and that is still, connected to the surface in the north, east, and south. It was first shown in Hafkenscheid et al. (2001) and later in Spakman and Hall (2010). The deepest part of the Banda slab reaches the 660 km discontinuity. Spakman and Hall (2010) showed kinematic reconstructions suggesting that subduction of the Banda embayment that formed the Banda slab started around ~15 Ma with arrival of the Sula Spur, a continental ribbon that formed the westward prolongation of the Bird’s Head (Figure A13) in the subduction zone. This was associated with delamination of its mantle lithosphere and ultra-high temperature metamorphism in crustal rocks now found on the island of Seram. This metamorphism was recently dated at 16 Ma (Pownall et al., 2014), suggesting a somewhat earlier initiation of subduction of the Banda embayment. A recent reconstruction of the fold-thrust belt of Timor, in the south of the Banda embayment, shows that at least the last 8 Myr of subduction consumed ~350 km of (continental) lithosphere (Tate et al., 2014; 2015). The lithosphere now lying between 650 and 500 km depth thus must have subducted prior to ~8 Ma and after 16 Ma. We use 12±4 Ma as estimate for the moment of its subduction.